QBC’s dry hematology analyzers are a valuable tool for point of care complete blood count (CBC) testing. Our prescription point of care instruments can provide immediate and critical information, helping you intervene while the patient is still in the office thereby improving diagnosis and patient outcomes. Simple and robust testing means that once a sample is obtained it can be processed immediately by a variety of properly trained staff, which is especially useful in resource-strapped facilities. Compact, accurate, and easy to use, QBC’s dry hematology analyzers are ideal for point of care testing. Our products employ our proprietary quantitative buffy coat analysis to deliver fast and precise CBC results that are an essential aid in diagnosing a patient’s condition. By eliminating the need for bulky liquid reagents and diluents, QBC dry hematology analyzers also free up valuable countertop space in Physician’s Office Laboratories (POL’s), clinics, blood banks, and other facilities. Drucker Diagnostics provides two point of care hematology testing systems: the QBC STAR and the Autoread Plus. Both of these devices use a small 70 microliter venous, capillary, finger or heel stick sample. Drucker’s proprietary dry hematology disposables come with everything you need to run the sample already dry coated inside the sample tube. Once the disposable is filled and mixed, the sample is processed and analyzed to deliver results in as little as seven minutes. Use our products for point of care CBC testing results for hematocrit, hemoglobin, MCHC (mean corpuscular hemoglobin concentration), platelet count and total white blood cell count. We also provide the white blood cell differential for granulocyte count, granulocyte percentage, lymphocyte/monocyte count, and lymphocyte/monocyte percentage. Faster Results – QBC’s dry hematology point of care analyzers provide a self-contained testing solution that is perfect for prescribed point of care CBC testing. Rather than send samples away to the laboratory for analysis, you can get quantitative CBC results in just a few minutes. This promotes improved patient outcomes by allowing you to make real time treatment decisions and intervene earlier. 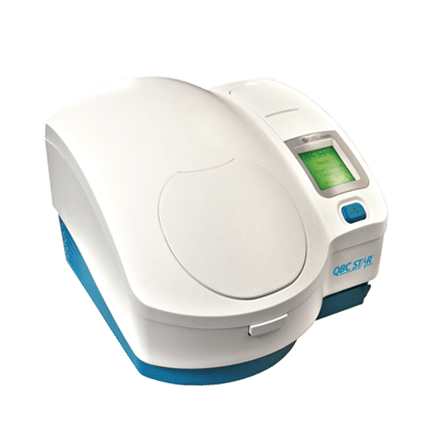 No Maintenance or Calibration – QBC’s dry hematology point of care analyzers do not require any routine preventative maintenance and there is no need to periodically calibrate the device. Our results won’t drift over time to due to changes in flow characteristics of filters or other components. Our point of care devices continually check that the equipment is functioning as good as the day it was shipped from our factory. Analytical Quality Control – QBC’s dry hematology point of care systems have multiple built-in analytical quality control (QC) checks that maintain the overall system integrity and the quality of the test results. Our point of care devices perform numerous checks, such as centrifuge RPM, image quality, and proper cell layer formation, on each and every sample to provide confidence in our CBC testing results. Pediatrics and POL’s – Dry hematology testing requires 70 microliters of whole blood, collected via a venous draw or a finger or heel stick. Parents appreciate the ability to quickly obtain test results which can aid in a diagnosis, such as helping to determine if an infection is viral or bacterial. Urgent Care – Faster CBC results means faster diagnoses and more effective interventions because the CBC testing results can be available while the patient is still at the clinic. CBC testing provides the urgent care clinic with an opportunity to provide a higher level of care than just waived testing. Blood Banks – Get hematocrit, hemoglobin, and platelet count with a Dry Hematology analyzer prior to the start of the collection process. Drucker’s point of care analyzers are ideal for busy blood banks and other collection facilities to help optimize the apheresis or whole blood donation process. Veterinary – The veterinary version of the Autoread Plus offers thorough screening, presurgical testing, and general health checkups in-house for a variety of species. Fast, rugged, and dependable, the veterinary version of the Autoread Plus is perfect to take to the field or barn or use in the office for quick and reliable point of care CBC test results. To learn more about Drucker Diagnostics’ automated hematology analyzers, or for more information about the dry hematology testing process, please contact a sales representative at sales@druckerdiagnostics.com. You can also browse the Drucker Diagnostics website where you’ll find technical specifications, frequently asked questions, white papers, and other information.